It was a crafty flashback as I taught the crafty crew how to make elastic bookmarks. Quick gift! Super fun & easy to make! I had a lot of my bottlecap pendants leftover from a looooong crafty time ago, so a lot of the ladies opted to use those for the charms on the bookmarks. 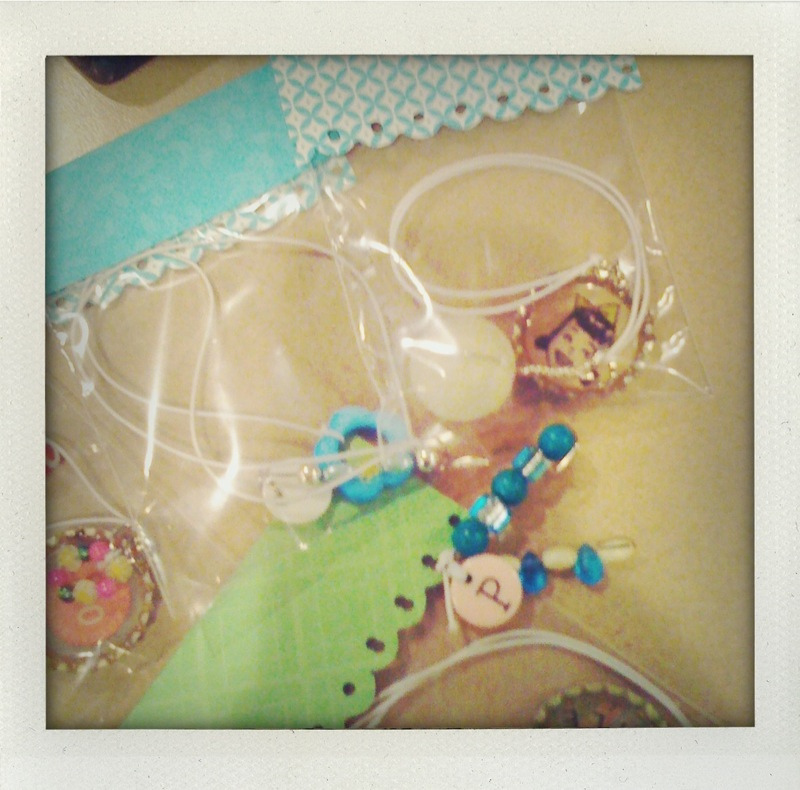 We also wrapped up our bookmarks in adorable packaging for giving as gifts! I'm also super excited because next month Crafty Night starts in a new location with a new agenda & a new set-up!! 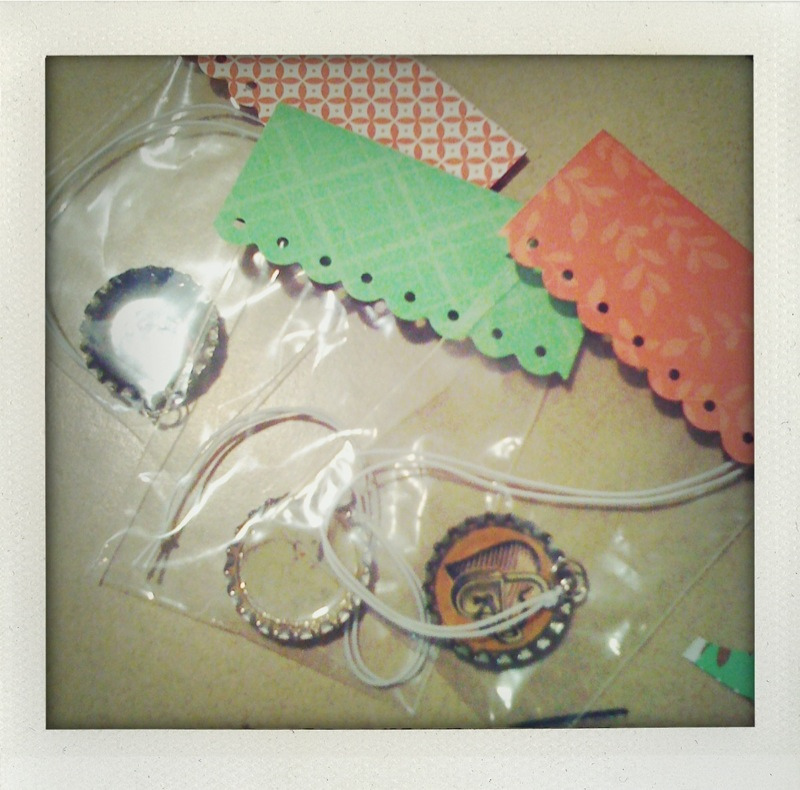 January will be the big kick-off & I'm asking for donations from all my crafty friends. I'll be giving away prizes throughout the night & putting together goodie bags for all in attendance. So, if you could donate a handmade item &/or 15-20 sample items, please email me @ whimsy-girl [at] hotmail [dot] com. I'd be ever so thankful & will make mention of your donation on my blog & will announce a complete list of those donating at the first Crafty Night in January! Thanks for those who have already donated. You are much loved!! I was just playing around with my bottle caps while thinking about something else to do with them. And voila, I saw this! I might be tempted to use it as a necklace instead, though. I used to make them as pendants for necklaces & sell 'em in the shop. I also have some used in keychains. They're fun to make! I would like to do a crafty night locally. How do you get the pictures in the bottle tops? and how do you get to punch a hole through them so neatly. I tried to do this in the summer for a school project and found it so difficult and it left a nasty jagged edge. PS - you are an inspirational mum! I would lovelovelove to donate little buts for the goody bags but I'm not sure they'd get there in time! Our next Crafty Night is not until January 18th. So if you think your crafty goodies would get here in time, that's great! If not, I understand!